The Cake Slice Bakers' cake for this month is a wonderful little lemon and almond cake that our cookbook author calls "Streamliner Cake." She notes that while it's not exactly clear where the name Streamliner came from, it might have been named for the streamlined, art deco-design trains and cars of the 1930s. Whatever the origin of its name, this luscious buttermilk cake is especially moist, light, and topped with a sunny lemon custard. The cake is delicious, but it's the thick, rich, sweet and tangy lemon custard that elevates this dessert to the next level. I loved the custard so much that I doubled the amount called for, then sliced the cake horizontally to make a layer cake: twice the custard in every bite. Combine the zest, milk, and 1/4 cup sugar in a medium saucepan and heat over medium-low heat until just hot. Meanwhile, in a medium sized bowl, whisk together the egg yolks, the remaining 1/4 cup sugar, and the salt until well-combined, then whisk in the cornstarch and lemon juice. Slowly whisk about 1/3 of the hot mixture into the yolk mixture. Pour the yolk mixture back into the saucepan of hot milk, whisking steadily, until the custard begins to thicken and bubble for one minute. Strain the custard through a fine mesh into a clean bowl, and whisk in the butter until melted. Place a piece of plastic wrap directly on the surface of the custard and refrigerate for two hours. Center an oven rack, and preheat the oven to 350 degrees. Grease a 9 inch round cake pan and line the bottom of the pan with parchment paper. Sift together the flour, baking powder, and salt in a bowl, then whisk to combine well. Using a stand mixer with a paddle attachment, combine the almond paste, butter, sugar, canola oil, and vanilla on low speed until blended. Increase the speed to high, and cream until very light and fluffy, about 5 to 7 minutes. Stop the mixer frequently to scrape the paddle and sides of the bowl. Blend in the eggs one at a time, adding the next one as soon as the previous one has disappeared into the batter. With the mixer on low speed, add the flour in three parts, alternating with the buttermilk in two parts, beginning and ending with flour. After each addition, mix until just barely blended, and scrape the sides of the bowl. Pour the batter into the prepared pan and spread it evenly. Rap the pan firmly on the counter to release any air bubbles. Place the pan in the center of the oven and bake until the cake is a deep golden color and a wooden pick comes out barely clean, about 42 to 45 minutes. Cool the cake in pan on a wire rack for 30 minutes. After 30 minutes, flip the cake out onto the wire rack, remove the parchment paper, and flip the cake back to right side up. Cool to room temperature. Place cake on a serving plate and frost the sides of the cake lightly with the lemon custard. Frost the top of the cake with remaining custard, then let the cake set in the refrigerator for about 30 minutes. Any leftover cake keeps in an airtight container in the refrigerator for up to three days. This recipe is from Vintage Cakes by Julie Richardson. 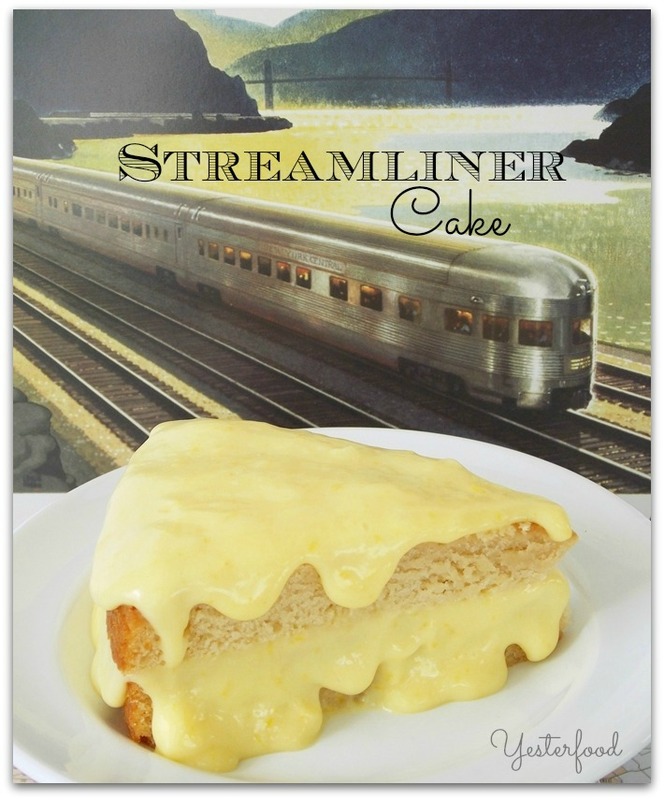 Streamliner Cake may have been taken to some of these great parties! Joy, This looks delicious...It would go wonderfully with my tea right now. Your photos are pretty and I like the idea of putting the custard in the middle too! It's a good use of the lemon curd since I made half the recipe and it was just enough for 9 squares. What a delicious looking cake! The custard is looking super tasty! You did an amazing job, like you always do! What a neat idea to double the custard! I loved it so much too! Hubby is not a big fan of lemon stuff (WHAT!!!??? I KNOW!!!) so I am not sure he'll enjoy it even with a single layer ... but... I could it it by the spoonfuls! (and I did!) Beautiful job! ALWAYS! That looks like a great spring/summer dessert! Ruth, it is so nice meeting you! I am following you back on Bloglovin! Your cake looks awesomely delicious and even the lemon custard is a tease. Looks like we all enjoyed this cake too which is good news!! You made yours a layer cake just to enjoy more of that custard!! Clever gurl! This cake is just awesome! Yum! This looks delish! Love your recipes! I'm a new follower on blog lovin from Social Sundays! Ashley, thank you so much for joining us for Let's get Social Sunday, and for browsing my recipes, too! :) I am happy to be following you back on Bloglovin! This cake looks so delicious Joy! Thanks for sharing on Creative Monday and have a wonderful week. I like the way you think, Joy! Twice the custard in every bite. This cake is interesting--the name and its possible origin and the sunny, happy looking yellow topping (and filling). Thank you for linking w/ See Ya in the Gumbo this week! I am so glad to see the bowl of custard at the end of the post - I think that is how I would eat this! What a wonderful looking cake and I bet it is rich and great tasting. Love the idea of making it a layer cake! And your pics are stunning as usual. Fabulous on the maps background. I let the almond paste scare me away from this one, but yours looks amazing! Love the travel themed pics, you always have such great photos. Linked up and now following via G+ and Twitter. Hi Found you on the Bloggy Friends party. I love lemon and this looks so good. New follower on Bloglovin' - I love recipes from the days gone by! I agree that the lemon custard was the best thing, and I love that you filled the cake with it too - the more the merrier. I love the concept of this blog and this cake looks scrumptious! I *love* the concept of your blog! :) Such a clever idea & that cake? Omg, girl. Mmmmmmm! I'm so glad to "meet" you! I love food, cooking, baking and history so this is wonderful! I am looking froward to looking around your blog! so interesting! I love lemon & almond this looks amazing! Come link up or just visit sometime I am @ DearCreatives.com I will definitely have to try this recipe. Wow, sounds perfect for when we have people over. Saving this one!! Jamie, thank you, and thanks for coming by! I am happy to be following you on Google+! This is what I'm talking about! Custard coated cake looks delish. Thank you for sharing. Sue, thank you so much! I enjoyed my visit to your blog....that Butterscotch Apple Fluff looks delicious! :) Thank you for coming by! I am featuring you in today's post. Thank you for sharing at Tuesday Trivia. I absolutely LOVE the photos. But the cake looks good too! Lovely cake! Custard sounds especially good! Thanks for adding your awesome cake to my recipe swap hop. I'm a Bloglovin follower. Congrats on your new spot with Let's Get Social. What a neat cake! It looks very ooey, gooey and yummy! Oh wow Joy, this looks fabulous. I have two favorite things chocolate and lemon. I am sure this is great. Porsche, it is easy, and I hope you love it! :) Thank you so much for coming by! We are going to just love your cake, it looks delicious! Your recipe is fabulous and thank you so much for sharing with Full Plate Thursday. Have a great weekend and come back soon! I have seen this cake all over the internet this week, Joy! It's on my list of things to make! :) Thanks so much for joining us at last week's All my Bloggy Friends .... We look forward to seeing what you share this week! How cool! I always love history and to connect it with food, even better! Thank you for sharing this @ The Show Off Blog Party! Oh your cake turned out beautifully, Joy...and I love your photos....they really take me back in time. So lovely. And what a fabulous cake this was! Looks beautiful and delicious! I love the creativity in your photos too! Thank You so much for sharing at A Bouquet of Talent this week! Happy Friday! Thank you, Kathy! I did have a lot of fun with this one! :) Thanks for A Bouquet of Talent! I would double the custard too. Love custard. You take such great photos. Beautifully styled. Yes! I knew we were kindred custard spirits!! :) Thank you so much, Connie! This looks amazing! New follower through Bloglovin. Oh my heavens... custard, AND lemon, AND almond?! I must make this!!!!! It looks absolutely amazing!! Three of my favorite things in one cake!! If you make it, please invite me over- I would love to have another slice! ;) Thank you so much for stopping by!